Honda has been teasing us with the looks of its Fit-based compact crossover for months. Now the production version, dubbed the HR-V in the US, has finally been unveiled – in photographic form, at any rate – at the 2014 New York Auto Show. The CUV will slot into the brand's range this winter, and at the moment the company is keeping mum on many details about the new model. 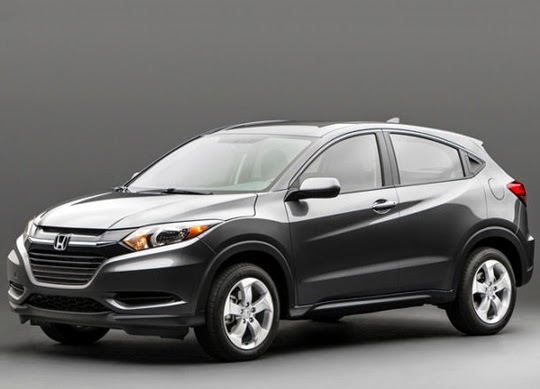 Honda has given no indication about which powertrains the HR-V is going be to offered with. It's expected that the 1.5-liter direct injected four-cylinder and CVT is going to be one option, but the possibility of also offering a turbocharged version of the four has also been rumored. The automaker says more details are coming closer to launch. The HR-V will slot in below the CR-V in terms of size and price when it goes on sale. All models are being built at Honda's new factory in Celaya, Mexico, that also builds the new Fit for North America. Scroll down to read the details in the release. NEW YORK, April 17, 2014 – Honda will continue to expand its lineup of small cars aimed at the next generation of buyers with the launch of the 2015 Fit subcompact car (http://automobiles.honda.com/fit) and the all-new compact SUV, the Honda HR-V (http://automobiles.honda.com/hr-v) that will come to market this winter. Together the Fit and HR-V will represent a significant growth opportunity for Honda in the U.S., with both models produced at the automaker's newest North American manufacturing facility located in Celaya, Mexico, which allows for production flexibility to meet market demand. On-sale at Honda dealerships nationwide this month, the all-new 2015 Fit establishes a new benchmark in the subcompact segment. The Fit delivers a class-leading combination of interior space, feature content, fuel efficiency and value. With a long list of new standard and available features including a multi-angle rearview camera, Bluetooth® connectivity, Expanded View Drivers Mirror, 7-inch Display Audio with HondaLink™ connectivity and LaneWatch™ display, the Fit is an unparalleled value with an MSRP starting at $15,5251, representing an increase of only $100 over the model it replaces. The new Fit is equipped with a more efficient and powerful Earth Dreams Technology™ 1.5-liter direct injected 4-cylinder engine. Available with either a new Continuously Variable Transmission (CVT) or 6-speed manual, the 2015 Fit earns class-leading2 EPA fuel economy ratings of 33/41/36 (city/hwy/combined)3 when equipped with the CVT in LX trim. Retaining a similar exterior footprint to the outgoing model, the new Fit is slightly shorter (-1.6 in.) and wider (+0.3 in.) with a longer wheelbase (+1.2 in. ), resulting in improved handling and stability. Inside, the Fit delivers class-leading passenger space measuring 95.7 cubic feet, an increase of 4.9 cubic feet compared to the previous model. Passengers sitting in the backseat will appreciate the Fit's abundant rear legroom, which increases by 4.8 inches to a best-in-class 39.3 inches. With the Honda-exclusive Magic Seat® offering multiple seating configurations, the Fit provides an unrivaled 52.7 cubic feet of cargo space when the second row seats are folded flat. Showcasing Honda's commitment to advancing mobility of all forms, the new version of ASIMO (www.asimo.honda.com) made a special demonstration at the New York Auto Show, as a part of a week of activity in New York City. ASIMO - which stands for Advanced Step in Innovative Mobility - features enhanced hand dexterity, including the ability to sign in both Japanese and American sign language, as well as the ability to run faster than previously, climb stairs more smoothly, hop, jump, balance on one foot, and transition seamlessly between walking and running, among other new and unique capabilities. 1 Manufacturer's Suggested Retail Price (MSRP) excluding tax, license, registration, $790 destination charge and options. Dealer prices may vary. 3 Fuel economy rating for 2015 Fit LX equipped with CVT. Ratings determined by EPA. Use for comparison purposes only. Your MPG will vary depending on driving conditions, how you drive and maintain your vehicle, and other factors.